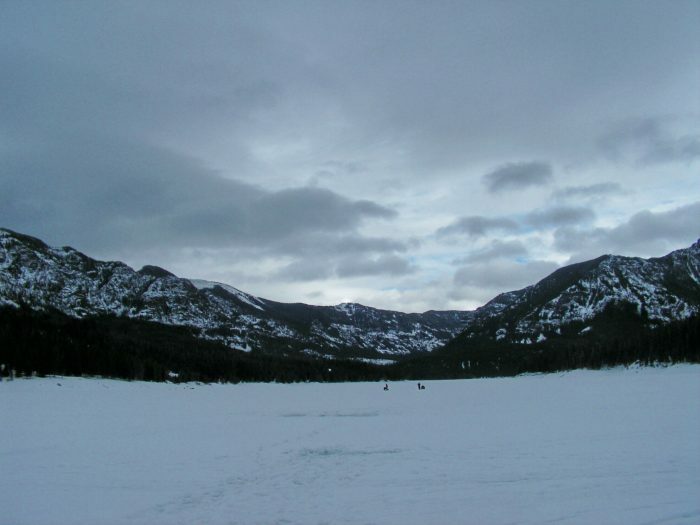 Ice fishing is under way in many of Montana’s lakes. The other day I fished Hyalite Lake near Bozeman. This beautiful lake is full of Cutties and Brook trout. Occasionally a protected grayling will come through the ice. The trout trek included my son “Kyle Kong” and his friend “Jon Boat”! The road to the lake is plowed but slick. Take your time. We haven’t fished together in awhile so all of us were excited to Rip Some Lips. Several parties were fishing but, few were catching. One woman we passed had caught 2 and she made sure to tell us that her husband was getting Skunked! The ice is weird. If you are walking on a broken trail, the snow is compressed enough to safely travel. Once onto virgin snow, the slush under the snow makes for hard walking. The ice is 6-8 inches thick but is covered with snow and slush. We stopped short of where we wanted to fish and started jigging. Brookies were abundant and seemed bigger this season. A small chartreuse jig, tipped with a small piece of worm, did the trick. Maggots were not on the menu today. Our holes were close to the shore but in 20 plus feet of water. Many fish hit on the drop. For a while, Montana Grant was putting on a clinic. Kyle Kong finally decided to drill some fresh holes. Once in his new holes, trout were coming out. Jon Boat was having trouble. A few bites but no action. We threatened Jon Boat with the Walk of Shame for getting skunked. This would require him to walk naked back to the truck. He reminded us that he drove, so we backed off. Over the course of 5 hours, we iced a couple dozen trout. The Brookies were 10-15 inches and the Cutthroats were up to 18 inches. Most of the fish we caught were Brook trout. They would filet up nicely for a wonderful fish dinner. With some more cold weather conditions will improve. Fishing with family and friends is always the best. 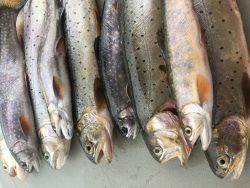 For more Montana Grant, find him cleaning fish at www.montanagrantfishing.com.